CARMEL, NY – Putnam County Executive MaryEllen Odell was joined by other elected officials, community leaders and seniors at the ribbon-cutting ceremony of the Friendship Center of Philipstown—the new county-operated senior center, on the former Butterfield Hospital Property in Cold Spring on Tuesday, Dec. 18. The 6,000 sq.ft. senior center will provide meals, social activities, physical fitness classes, and other programs through the Office of Senior Resources. The need for a senior center for the Philipstown community had been discussed for more than a decade. County Executive Odell has been committed to the project since at least 2013. Assemblywoman Galef agreed with Sen. Serio. “Good things don’t happen overnight, but this senior center proves that good things can still happen,’ she said. Cunningham’s predecessor, Patricia Sheehy, was also in attendance of the ceremony. “I am thrilled to have been able to walk through those doors and see this senior center be a reality,” Sheehy said. 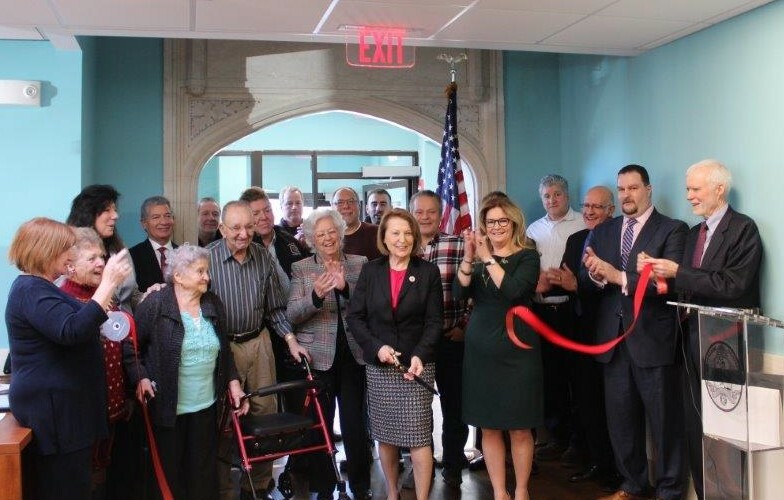 Joining the officials at the ribbon cutting were two local centenarians, Rosina Parcesepe and Joseph Etta, both of Cold Spring, and many other seniors who are looking forward to being active participants at the new center. The Friendship Center of Philipstown is located 1756 NY-9D, Cold Spring, NY 10516. For more information about the programs and services available through the Office for Senior Resources, visit www.putnamcountyny.com/osr. Photo caption: Leg. Barbara Scuccimarra, surrounded by seniors, elected officials, representatives from Teamsters Local 456, Plumbing and Heating Local 21 and North East Regional Council Of Carpenters Local 279 as well as community leaders, cut the ribbon at the grand opening celebration of the Friendship Center of Philipstown in Cold Spring on Tuesday, Dec. 18.